As we can see the difference 0x3677 or 13943 bytes for all of them apart from the file–open method. Ignoring the file-open method for now I could have used an instruction to substract with ESI but that would have used up all my 6 bytes leaving no bytes to use for the jump. So I used the mov si,0x???? instruction which changes the last two bytes of our ESI register and using only 4 bytes. To exploit all the 3 remaining methods I used the highest value so that it still falls in our buffer which from the table is 0x4289. The reason the file–open method wont work when using the value 0x4289 is too low and does not fall in our buffer whereas the rest are at the same place or in close proximity. Now that I know the best value to use to change our ESI register using up 4 bytes and leaving 2 bytes for my jump. So a simple jump say call esi (0xffd6) should do the trick, but as always its never straight forward. From the choices of instructions below only JMP DWORD PTR DS:[ESI+??] worked for all JP2 open methods. The JMP DWORD PTR DS:[ESI] instruction did work on one machine though but what good is that working on one XP machine out of 5 :-). The problem with JMP DWORD PTR DS:[ESI+??] instruction is that its uses a 7th byte on our stack which we dont control, luckily this value has always been 0x34 so JMP DWORD PTR DS:[ESI+34] still takes us into our buffer. Using JMP DWORD PTR DS:[ESI+??] has another problem though in that I had to be precise for it to pick up our next jump address at that point. So once aligned and the buffer filled with call esi addresses (as the location might vary) the call esi took us back into the buffer again and this time our return addresses acted as nops and slided straight to our shellcode. 3. Buffer will contain call esi return addresses used in step 2. 5. Our return address nops meet our normal nops and then our shellcode. 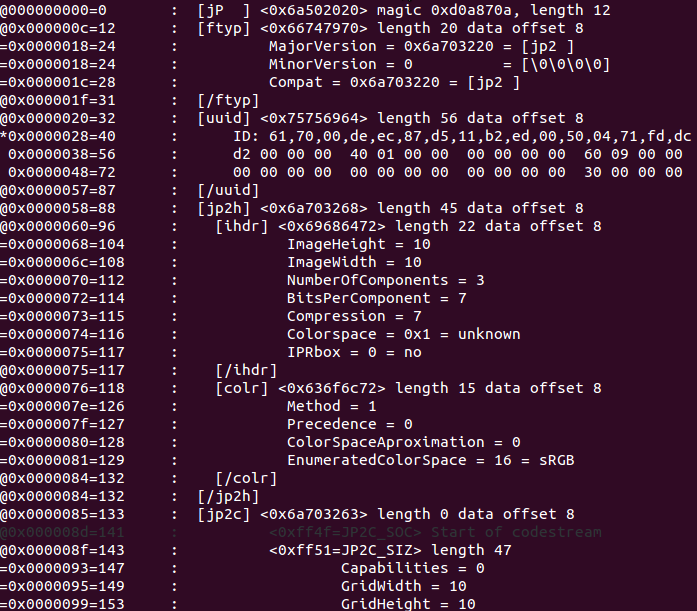 In the above exploit the JP2 header information was obtained using the ExifProbe tool on a Ubuntu machine. Applications using Jasper software to parse JP2 files can also be exploited to cause heap-based buffer overflows when copying the QCD marker segment. Have a look at Secunia’s advisory here. I have already made discoveries in applications XnView, IvanView and PhotoLine and they are probably many more to be discovered. If you do discover any vulnerabilities you might want to think about submitting through Secunia’s Vulnerability Coordination Reward Program (SVCRP). Here is a perl code you can use to create JP2 files with different QCD data sizes to test applications supporting jp2 to see if it triggers any overflows. You just need to change the datalen variable. This IrfanView exploit only works on Windows XP machines and has not been tested on any Windows 7 machines, also the exploit will not work if the DEP settings have been changed to “OptOut” or “AlwaysOn”, so there are still limitations but someone with more expertise may be able to utilize those 6 bytes at esp more efficiently. Finally an update has been released so make sure to let everyone know those using Irfanview to update their software immediately.